Thank you, Pam for having me as your guest today. 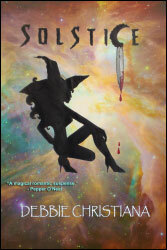 My new romantic suspense, SOLSTICE, was released on May 4th and it was great fun to write. For my second novel, I wanted to try something a little darker and edgier – and Solstice was born. It’s a story of magic, murder, and a 250-year old family curse that takes the life of one person per generation. My main character, Sofia Palmolosi is an Italian witch or a Strega. I have read many wonderful ‘witch’ books but none that really delved into Italian Witchcraft, Stregheria. Growing up with a Sicilian grandmother that talked about the Stregas of her village in Sicily, it seemed like the natural thing to write about. Stregheria is an ancient religion dating back to the early Etruscan people of pre-Roman Empire Italy. Tana, their Mother Goddess is still part of the Stregheria worship even though she was replaced with a new, younger Goddess, Diana, as the Roman Empire grew and became powerful. Stregheria and Wicca have similarities but in and of itself, Stregheria is different. There are eight celebrations throughout the Wheel of the Year, although they are called Tregundas, not Sabbats. The moon is an old and important part of the rituals of Stregheria. The ancient teachings of the Mythos of the Full Moon, links the light of the moon to the passage of the soul. Each morning the God would travel from east to west across the sky gathering souls who had left their bodies while he was gone. He then went deep into the Underworld and presented them to the Goddess. She, in turn, gave them to the Realm of Luna (the moon). As more souls were collected, the light of the moon increased until it was full. As the souls were reborn back to earth, the light of the moon would decrease until it was dark. Stregheria is steeped in mystery and secrets. Until recently, you simply could not become a Strega. It’s a hereditary religion and you had to be born into a family of Stregas. The spells, incantations, traditions and rituals were passed down from generation to generation. Today if you wish to walk the path of the Strega, you can learn the ways, but not all will be revealed to you. Many aspects of the ‘old religion’ or La Vecchia Religione will remain an enigma, only privy to those of the sacred bloodline of the Strega. Time is running out for Armend Zogu. The 250-year old family curse on his head will claim him on his 30th birthday, the winter solstice. Sofia Palmalosi is just the Strega who can save him. A descendant of a long line of powerful Italian witches, their magic was a gift bestowed on them by the Goddess Diana. In order to break the curse, Sofia and Armend must piece together the sheet music from an old violin sonata that Armend’s ancestor wrote for his forbidden love. Together Sofia and Armend embark on a journey from New York to Sicily and the ancient ruins of Diana’s temple and back to New York while fighting a battle of wits and magic with a psychopath who wants them both dead and the curse intact. If the curse doesn’t kill Armend, breaking just might. Sofia paused on the marble steps outside her parent’s art gallery. The Manhattan street below bustled with New York activity. People shouted, cabbies leaned on their horns, and a siren wailed in the distance. The warm October sun beat down on her, yet it couldn’t quell the chill that quivered down her spine. She stood still and waited. From the corner of her eye, she caught a glimpse of two casually dressed men. They appeared to be in a heated conversation, but from behind their dark glasses, Sofia knew they watched her every move. Could she get to the front door of the gallery before they made their move? She climbed a step and stopped. She rifled through her purse and ascended another step. Three more to go. Powerful arms snaked under hers. “Sofia Palmalosi?” a blond man with a southern drawl asked. “Please come with us,” said the dark haired man. Defiant, she crossed her right leg over her left and dropped to the ground. “Ms. Palmalosi, don’t do this,” whispered an irritated voice. The man on her right tried to lift her without drawing unwanted attention, but she remained seated in her resistance. Sofia closed her eyes and relaxed her body. With deep cleansing breaths, she cleared her head and summoned the Lare, the spirits of her ancestors. In her mind, she repeated the incantation. And offer to me your gentle aid. The wind picked up and cool gusts blew against her face. Her eyes fluttered open. Bits of litter and leaves spun within the vigorous whirlwind that surrounded them. The men on each side of her fought to keep their balance against the unexpected squall. Their free hand flailed in the air as if they were swatting at a swarm of hornets. The Lare wouldn’t hurt them. They were mischievous, not malicious. Sofia sat patiently as first one, then the other man, let go of her, needing both hands to break their fall as they tumbled to the ground. From behind, another pair of firm hands gripped under her arms and raised her to her feet. This time her legs straightened and supported her. The wind had calmed. The Lare had vanished. “What the hell are you doing?” a new voice demanded. They mumbled an apology or obscenity and left. Sofia crossed her arms over her chest and looked to the last man standing for an explanation. Once more, spellbound by his eyes, she took a step back and caught her breath. She should be doing the bewitching, not him. He stood a few inches taller than she did. His black hair was longer than most men chose to wear theirs these days. He sported a neatly trimmed beard. Intrigued by the handsome man who caused the Lare to vanish, she went inside. Debbie Christiana would sit in her room as a little girl and write stories about ghosts, unexplained events and things that go bump in the night. She combined her love of the paranormal with her fascination of unusual love stories and decided to write paranormal romance. She has two novels published with Black Opal Books, TWIN FLAMES and SOLSTICE. In 2012, she had two short stories published. The Land of the Rising Sun, was one of ten included in the anthology BITES: Ten Tales of Vampires and The Thirteen Steps is featured in BELTANE: Ten Tales of Witchcraft. Debbie is a member of RWA and the International Thriller Writers, Inc. She is the Secretary of her local RWA Chapter of Connecticut and Lower New York. She lives in Connecticut with her husband and three children. Thanks, Pam, for letting come visit today! I'm Strega by blood, even if I'm the only one in the fam who knows that. When I was studying all the old religions, I found so much of Stregheria to be simply part of life in my family. The traditions were being passed along without anyone truly realizing it. It was a cool realization to come to, but with no one actually understanding what it was, I had no one to ask questions of. Bummer. The hereditary part of the Strega line is fascinating. I wonder what made them change so that people could just become Strega without having the blood line. I'm not 100% sure but I think in part it happened with the influx of immigrants, especially Italians, in the late 1800's and early 1900's to this country. Especially if they lived in a city like NY. Their whole world changed and so did their religion - to a certain point. I enjoyed your except very much. And I'm always fascinated by witchcraft of any kind. So, I'll have to have your book. Thank you, Teresa! It was fun to write. I'm also fascinated with witchcraft. I hope you enjoy it. I'm glad you stopped by. Just out of curiosity, Debbie, does the strega thing run in your family?